To Cite: Aribas B K, Arda K, Aribas O, Ciledag N, Yildirim E, et al. Percutaneous Management of Cystobiliary Fistulas by Small Catheters, Iran J Radiol. 2017 ; 14(1):e13454. doi: 10.5812/iranjradiol.21088. Objectives: This study aims to use mean volume of fluid, which is drained from a liver hydatid cyst with cystobiliary fistula developing after percutaneous treatment, for determining the type of treatment as surgery versus conservative. Patients and Methods: The cohort data was collected retrospectively from 10 out of 90 hydatid cysts in 10 out of 65 patients treated percutaneously with needle and catheterization methods. Groups were defined as surgical and conservative. The mean volumes until the 20th day after detection of the biliary fistula were used. In addition, the mean volumes until the 20th day of 42 catheterization patients without biliary fistula were used as controls for quantitative analysis. Results: All 10 cysts with cystobiliary fistulas were managed with small (8 F) catheters. All patients in the conservative group had < 211 mL/day mean drainage for the 20 days. For the patients that developed cystobiliary fistulas of liver hydatid disease, 30% required surgical treatment. After receiver operating characteristic (ROC) curve analysis, the cut-off value for success of hydatid cyst treatment was 206 mL/day of drained content. Conclusion: To reduce superfluous costs and time, cystobiliary fistula with < 206 mL/day mean drainage until the 20th day may be efficiently treated with percutaneous drainage using small catheters. Cystobiliary fistulas have been of a great importance in both the natural processes and classical treatment stages in liver hydatid disease (1, 2). The incidence of biliary tract involvement in patients with hepatic hydatidosis varies in different studies, from 1% to 17% (3, 4). Cystobiliary fistula following percutaneous treatment is managed with prolonged catheterization, with or without endoscopic treatment, and rarely requires surgery (5). Also, in a study by Canyigit et al. the authors reported that it was possible to close the fistula using something like glue instead of performing surgery (5). There are various approaches for major (≥ 5 mm) or minor (< 5 mm) cystobiliary fistulas developing after percutaneous treatment (4, 6). However, it is difficult to measure fistula diameter on cystography because of the distension of cysts (1). We believe that using mean daily drainage volume in a proper time interval is more useful in practice than using fistula diameter on cystography to decide the therapeutic approach. Nevertheless, there is no clear cut-off value of mean daily drainage volume for success in managing cystobiliary fistulas of hydatid cysts developing after percutaneous drainage. In practice, a cut-off value could be used for eliminating redundant costs and time. The objective of the present study is to use the mean volume drained from a liver hydatid cyst with cystobiliary fistula developing after percutaneous treatment for predicting the most adequate therapeutic approach, either conservative or surgery. In this retrospective cohort study, patients were consecutively chosen from those with liver hydatid cysts percutaneously treated in the radiology department of Ankara oncology education and research hospital. Cystobiliary fistulas were separated into two groups, according to the treatment method. Drainage volumes were studied for determining if patients should undergo surgery or conservative percutaneous treatment, which resulted in a surgical group and conservative group. Practically, the mean volume until the 20th day after detecting the biliary fistula was used. A total of 65 patients with 90 hepatic hydatid cysts from 1997 to 2010 were recruited into this retrospective study. The mean age of our patients was 44.9 ± 19.2 years. Among them, 22 were male and 43 were female. We studied a subgroup of 10 patients of the 65 patients who developed a cystobiliary fistula. Informed consent was obtained from all patients. All data was obtained from the files after the permission from our institutional review board. Pre-treatment evaluation of the patients consisted of clinical examination performed by a surgeon at an outpatient setting and laboratory tests, including liver function tests, international normalized ratio (INR), and serologic tests for hydatid disease. Evaluation of the size and type of drainable cysts was based on ultrasonography (US) examination performed by two experienced radiologists. Gharbi’s classification was used (7). There were two groups in relation to treatment modalities: a needle group and a catheterization group. We decided the treatment plan using 6 cm as the cut-off diameter (except for type three and four cysts). In the needle group, PAIR (puncture, aspiration, injection, reaspiration) (puncture with a 20 gauge Chiba needle, aspiration, injection and aspiration of contrast medium, injection of hypertonic saline solution, and reaspiration) was used for cysts < 6 cm. The volume of aspiration and the volume of the injected contrast medium was 50% and 35% of the first cyst volume, respectively. Hypertonic saline (20% NaCl) was injected at 35% of the first cyst volume after exclusion of any communication on cystography and taking back of the injected contrast medium. The frequency of the hypertonic saline was three. All fluid was evacuated and the needle was withdrawn after 20 minutes. For the cysts ≥ 6 cm, the catheterization method (puncture with an 18 gauge Chiba or Seldinger needle, aspiration, injection and aspiration of contrast medium, injection of hypertonic saline solution, and catheterization) was performed, which followed the same PAIR method initially, but included catheterization rather than reaspiration (Figure 1). Figure 1. Eighteen-year-old male with hydrated cyst of 95 mm × 63 mm × 102 mm in the seventh segment: A, Cystography shows the catheter in the cyst but no fistula; B, Cystography demonstrates biliary fistula to the right bile duct and choledoc after 37 days. Fistula diameter could not be measured. Mean drainage volume was 112 mL; C, The fistula diameter was 4 mm (long arrow) on ERCP; releasing contrast medium from the nasobiliary catheter to the hydatid collection on the 69th day. This decreased a week after procedure (short arrow in D) and ceased 2 weeks after (E). Solidification was seen 11 months post-procedure on ultrasonography (F) and on CT (G). Cystobiliary fistulas developed in 10 cysts either during the procedure or during the drainage period. Bile on sponge was visually determined with reflection of a yellow color. Because the yellow color was not hazy, we were able to determine that the drainage was not due to an infection. Cystography was performed for all suspicions of a cystobiliary fistula. All the developing biliary fistulas were treated with 8 F catheters. Daily drainage volumes of each hydatid cyst with cystobiliary fistula were recorded and used for the calculation of the mean drainage volume during the drainage period or before biliary intervention, either with endoscopic retrograde cholangiopancreatography (ERCP) or ERCP plus nasobiliary drainage. Then, the mean daily drainage volume of hydatid cysts with cystobiliary fistula was calculated. Initially, percutaneous treatment alone was performed with pigtail catheter drainage. The ERCP was performed, provided that daily percutaneous drainage did not decrease or excessive drainage was not present, as previously described in the literature (2). Cystobiliary fistulas were separated into two groups. Drainage volume was accepted as data for determining treatment. This differentiation resulted in two groups: surgical and conservative. The mean volumes until the 20th day after detecting the biliary fistula were chosen. Mean volumes until the 20th day of 42 catheterized patients without biliary fistula were used as a control group. The time limit was three months until stopping of the drainage. Catheter irrigation volumes, if performed, were excluded from the drainage volumes. Follow-up was performed every month for the first six months after treatment, every two months from 6 to 12 months, and once a year thereafter. The volume of each cyst, both before and after percutaneous treatment, was calculated using the ellipsoid formula, multiplying three diameters by 0.523 (8, 9). Differences in cystic volumes before and after treatment were calculated. The Mann-Whitney U-test and Chi-square test were performed. A two-tailed P-value < 0.05 at a 95% confidence interval (CI) was accepted as significant. Receiver operating characteristic (ROC) curve analysis was used for determining the cut-off value. Table 1 shows the features of cysts with/without cystobiliary fistulas. The mean age of these 10 patients was 48.9 ± 16.1 years. Right-upper quadrant pain was present in all (100%), cholangitis and fever only in three (30%), altered liver function tests in three (30%), and jaundice was seen in two (20%) patients. Ten patients developed cystobiliary fistulas; one patient in the needle group after three days, whereas the other nine patients in the catheterization group presented the fistulas at the beginning of the intervention (one patient), one day after (one patient), two (one patient), three (three patients), 15, 22, 27, and 37 days after (one patient each) (Figure 1). Table 2 depicts fistula characteristics. aSeven fistulas were seen in type one cysts, whereas three cysts were type two cysts. bThese P-values were obtained with the Mann-Whitney U-test. cFirst volume was before treatment. Cysts with bile fistula were larger than cysts without bile fistula (P = 0.013). dLast volume was recorded at the last follow-up after treatment. aFistulas were seen during the procedure in one patient, at one, two, three (three patients), 15, 22, 27, and 37 days, respectively. bOne of the five cases underwent only endoscopic retrograde cholangiopancreatography (ERCP), while for the other four cases ERCP and nasobiliary drainage were performed. Five patients with cystobiliary fistula were managed with ERCP, papillotomy, and nasobiliary drainage, of which three were in the conservative group and the other two were in the surgical group (Table 2). Fistula diameters could be clearly measured in these five patients with ERCP, and were < 5 mm (50 mL, 112 mL, and 211 mL drainage) in three conservative patients, seven mm (415 mL drainage) and 8 mm (477 mL drainage) in the two patients of the surgical group, respectively. Five patients with cystobiliary fistula were managed only with percutaneous drainage, of which four were cured percutaneously, and one, with a mean daily drainage of 305 ml, was treated surgically. Therefore, mean daily drainage volume was found to be 399 mL in three patients belonging to the surgical group with cystobiliary fistulas. The mean daily volumes for the 20 days were 305 mL, 415 mL, and 477 mL in the surgical group, respectively (Table 3). All patients of the conservative group had < 211 mL/day mean drainage. After ROC analysis, the cut-off value for successful treatment of the hydatid cyst was 206 mL/day (Figure 2). aPatients (P) (number: seven, eight, and nine) were in the surgical group, whereas the others were in the conservative group. cBiliary intervention (BI) was performed on the 30th day (patient one), 69th day (patient three), 11th day (patient four), 19th day (patient seven), and 18th day (patient nine). dThis patient’s drainage ceased 11 days after detection of bile fistula. Figure 2. Receiver operating characteristic (ROC) curve analysis shows the cut-off value for successful treatment of hydatid cyst at 206 mL/day, with 100% sensitivity and 99% specificity. The area under the curve (AUC) is 0.9865. Secondary biliary fistulas after percutaneous treatment occur in 1.7% - 6.2% of cases (5, 10). In our study, 11.1% of the patients of our series suffered from cystobiliary fistula. Most biliary fistulas gain patency after complete decompression of the cavity and complete collapse of the endocyst (1-6, 10). ERCP has been considered as the gold standard in the assessment of intrabiliary rupture (3, 11). 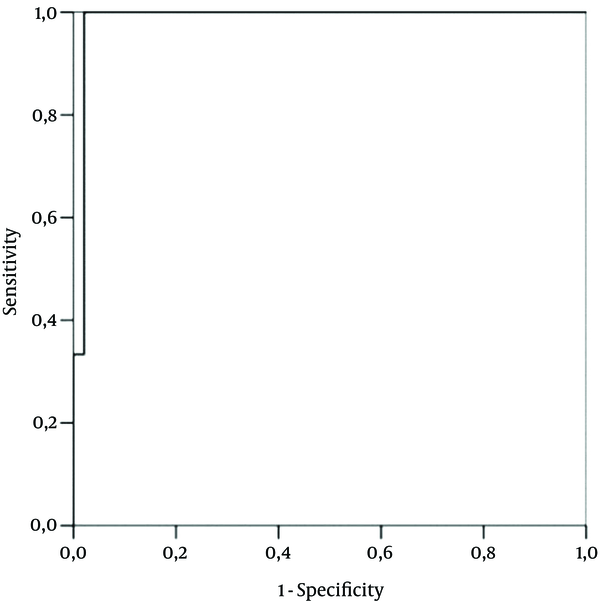 Fistula diameters can be evaluated more accurately on ERCP than on cystography (11-15). This may be partially due to the distension of cysts (1). Accordingly, we accurately measured fistula diameters by ERCP for our patients. Primarily, ERCP is used as a therapeutic tool in the management of biliary tract-complicated hepatic hydatid cysts (1-6, 10-17). It has been suggested that when a postoperative biliary fistula develops, despite all preventive measures, it should first be treated by conservative methods, and if it persists, with endoscopic procedures (12). The persistent drainage of bile fluid from the cavity might be treated by simply keeping the drainage catheter in place (10). Although most external biliary fistulas close spontaneously; they persist in 4% - 27.5% of cases (12). Still, 72% of biliary fistulas have been shown to close spontaneously within two months (4). We believe that percutaneous drainage, whether associated or not with biliary intervention, can be performed for up to three months if daily mean drainage in 20 days is less than 206 mL with small catheters. The large biliocystic fistula, defined as a fistula with a diameter ≥ 5 mm, manifests clinically only when it allows hydatic cyst content to pass into the common bile duct (6). Even though most of the time this cut-off is appropriate, there are situations when it is difficult to determine the aforementioned matters on cystography. Our emphasis is that daily drainage volume should be reevaluated before deciding the treatment method. If we had determined the cut-off value of the daily drainage volume, patients in the surgical group would not have necessitated redundant conservative treatment. Complicated hydatid cysts, which are reported in 15% - 60% of patients with liver hydatid cysts at the time of diagnosis, are generally managed with surgical treatment (13). Biliary fistula development has been seen more frequently in complicated cysts than in the uncomplicated cysts (14). Biliary communication is an absolute contraindication to the injection of a scolicidal agent because of the risk of sclerosing cholangitis. We believe that percutaneous drainage with only oral albendazole may be performed, if a patient with complicated liver hydatid cyst is at a serious risk for surgical treatment. Rarely, cysts either rupture into the pleural space or into the bronchial tree (15). With the same approach as the cystobiliary fistula, we successfully applied this to the percutaneous treatment technique and gave only oral albendazole in a liver hydatid cyst with pleural and bronchial fistula. We believe that ruptured hydatid cysts, including biliary ruptured cysts, can be treated by using only oral albendazole and catheter drainage. Additionally, two case reports on percutaneous biliary drainage have so far been mentioned in the treatment of hydatid cysts with biliary rupture (16). Lesions with biliary communications and biliary complications require therapeutic ERCP and/or surgery for management (17). Yagci et al. (2) preferred treating cystobiliary fistulas with biliary intervention, if their output was low (< 300 mL) and of less than three weeks in duration, or output was high (> 300 mL) and of less than one week in duration in patients treated with surgical, laparoscopic, and percutaneous methods. Their success rate was 60% in their 10 patients treated with 6 F - 9 F small catheters, despite prolonged percutaneous drainage and biliary intervention. Their success rate is comparable with our rate of 70%. However, their daily output or mean drainage volumes were not reported, and we could not compare this study with our series. 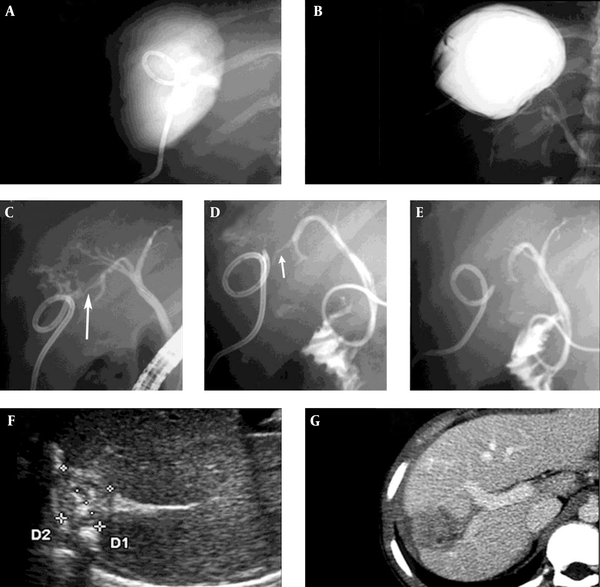 Compared to the available literature (1-20), this study provides a relatively large number of patients with cystobiliary fistulas treated by the percutaneous approach, whether associated or not with ERCP, which represents the practical drainage indication. However, any statistical analysis regarding the management of the fistulas in this study is limited by the fact that it considers only 10 items (10 cases). Therefore, only broad conclusions can be drawn regarding the small number of cystobiliary fistulas treated with catheters alone. We think that any value may be inconclusive due to the limited number of patients with fistula, and this calls for a multi-centric large series study of these fistulas for expanding the value to the general population. Another restriction is that the catheter size may affect the daily drainage volume. Based on this, the cut-off value may change according to the catheter size. All cysts with fistulas were type one or two, and small (8 F) catheters were used. The cut-off value of mean drainage volumes would be higher, e.g., 350 - 400 mL or more, if we had placed large-sized (> 10 F) catheters. However, small-sized catheters (< 10 F) have been proposed in reducing the occurrence of biliary fistulas; conversely, large-bore catheters have increased biliary fistulas in percutaneous treatment of hydatid cysts (10). We had mentioned our opinion on the percutaneous treatment of hydatid cystobiliary fistulas in a review (21). We had empirically considered that these cystobiliary fistulas with < 211 mL mean daily drainage until the 20th day may be effectively treated by percutaneous drainage with small catheters. Further, in this original research we have scientifically determined that this cut-off is 206 mL. As an alternative therapeutic modality, Bastid et al., using radio frequency as a scolicidal method, reported that percutaneous treatment of a complex hydatid cyst of the liver may be used as a scolicidal agent in the case of complex septated hydatid cysts of the liver (22). Also, they emphasized that further observations and follow-up of these patients are required to determine how this new therapeutic modality can be integrated into the therapeutic strategy of hydatid cysts (22). In conclusion, to reduce superfluous costs and time, cystobiliary fistulas with < 206 mL mean daily drainage until the 20th day may be effectively treated by percutaneous drainage with small catheters. Although the evidence is empirical, ruptured hydatid cysts, as in the treatment of complicated hydatid cysts in the other regions (18-20), can be cured percutaneously by minimally invasive treatment. Authors’ Contributions: Bilgin Kadri Aribas developed the design and Bilgin Kadri Aribas, Kemal Arda; Nazan Ciledag, Emin Yildirim, Seyhmus Kavak, Yusuf Cosar, and Ekrem Tekin played great roles in the result and material section; Ozge Aribas carried out statistical analysis and Bilgin Kadri Aribas wrote the discussion. Funding/Support: This study was not supported by any source from any company or any grant from any hospital or such kind of institute. The funding organizations are public institutions and had no role in the design and conduct of the study, collection, management, and analysis of the data, or preparation, review, and approval of the manuscript.